Today I lost my second Mom.. In this sport its funny how many times ones path crosses with a kindred spirit, This blog entry is of just such a person, whose daily driver, and I do mean year around daily driver, got another performance improvement. Not its first and not its last. Proud to have a good friend of the AoK boys document his baby's latest performance update. Here we go - As Fred started out - "Hey all, had a suspicious package arrive today at the local Canada Post Office inside the General Store. Free for all thread - issues, problems, want advice ? Update "AoK - New Dual Carb intake for the USA flathead 6"
Update Final preproduction prototype done!- "AoK - New Dual Carb intake for the USA flathead 6"
Part 4 - 1st car I purchased! .. Let the fun begin or locked down and let it rip! So the engine threw a rod, broke the crank, a bearing went out . . . Why? Part 3 - 1st car I purchased! .. Out comes the engine and the rebuild begins! 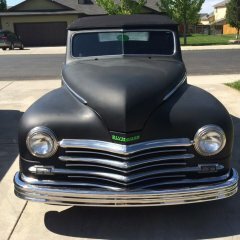 Update - "AoK - New Dual Carb intake for the USA flathead 6"
Thank you everyone for all your help, shout outs! Keep them coming.. Rough Spotters Guide for Intakes and their related technical information - Part 6 - Sharp or "Al Sharp Fan Club"